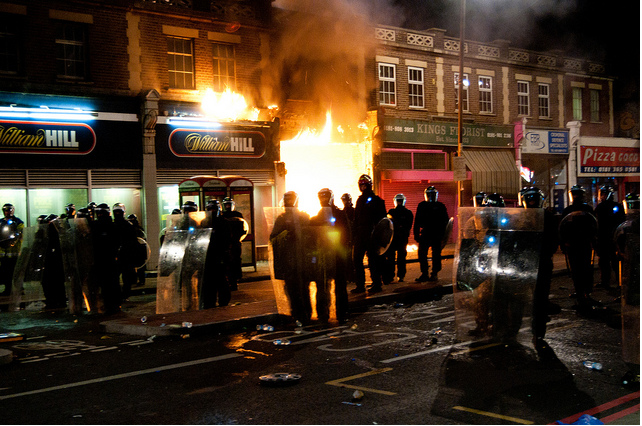 The looting and violence seen in Tottenham on Saturday spread around the capital last night. Trouble initially started in Enfield, to the extreme north of London before moving to Walthamstow and Waltham Forest. Shops were also attacked in Brixton, with Foot Locker and Currys taking the brunt. Further skirmishes were reported in Wood Green, Islington and Oxford Circus. More than 100 people have been arrested, with numerous reports of injuries. Three officers were struck by a vehicle in Waltham Forest and a youth was stabbed in Enfield. Last night's riots appear to have started with an orchestrated plan by youths intent on copying the violence seen in Tottenham. The initial trouble was sparked by anger at the death of Mark Duggan. Last night's violence is better attributed to opportunistic fartbrains seeking an adrenaline rush and ill-gotten trainers.